This large modern home has an exterior that could be described as cubist. It has an entrance of double height and an interesting juxtaposition of bold volumes. 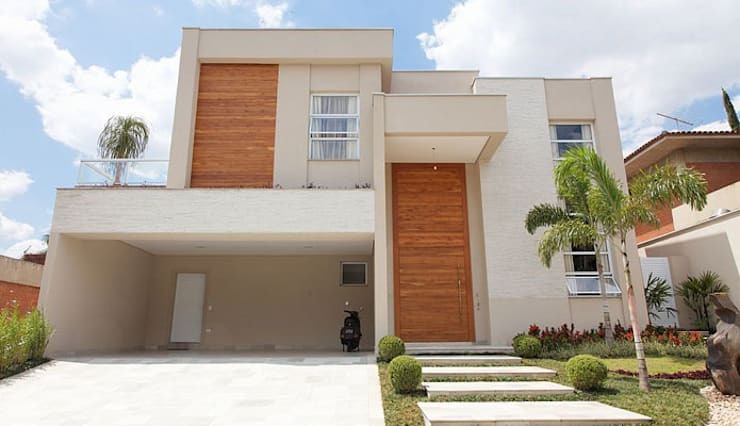 The building covers a vast 410m2 and the large proportions of each mass give the home an impressive, modern elegance. The exterior is composed of bold masses with clean uninterrupted lines. The various planes and garden landscape have been designed to draw the eye towards various heights on display here. This really accentuates the impressive height of the building. The exterior is clad in a soft white stone and vivid timber panels. These serve to soften the almost imposing presence of the home. They also give the home a rather tropical, luxurious ambience. The large outdoor entertaining area is another impressive part of this home. 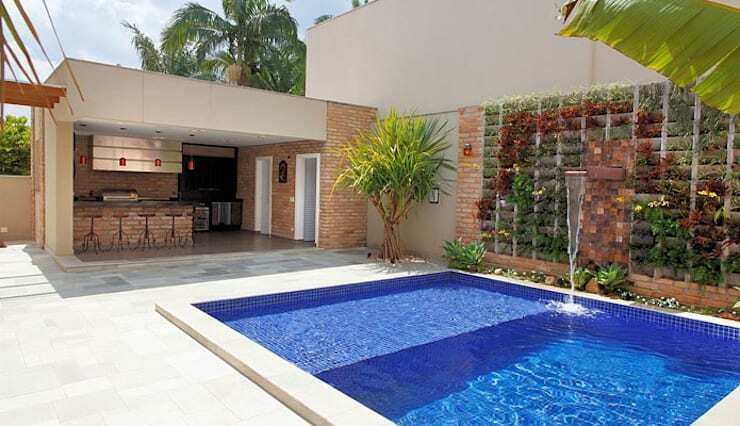 It possesses a great outdoor kitchen with a huge opening that leads directly to the pool area we see here. The transition point between the indoor and outdoor areas has been minimally demarcated with a slight shift in the floor level. 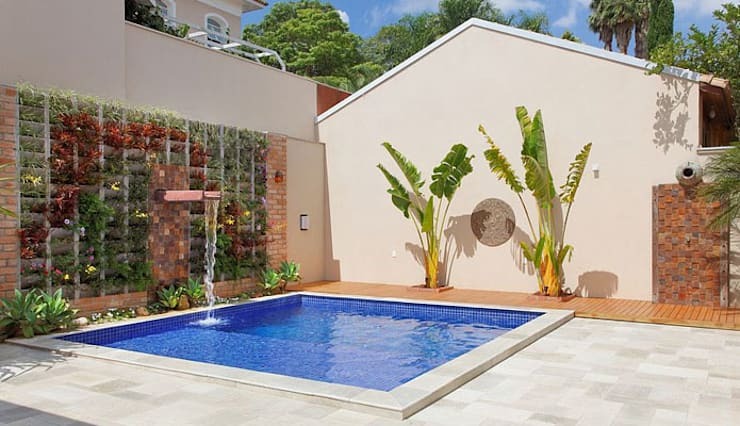 Finally, this home is located in tropical Brazil, so the bold flat roof offers adequate protection from the elements. 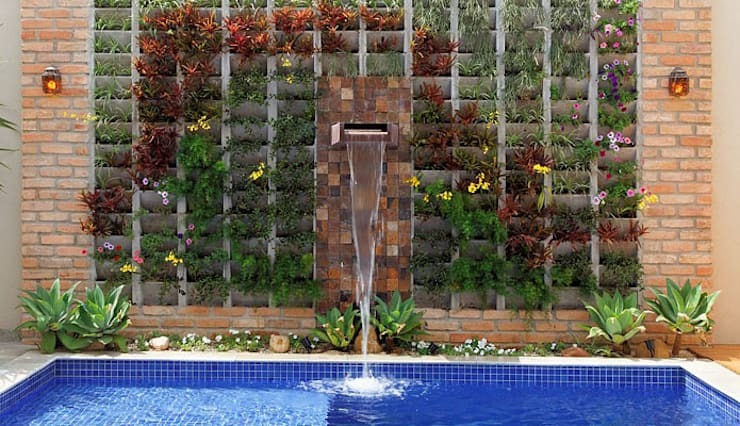 The lovely vertical garden is set among an elegant waterfall feature. This, together with the height, gives the outdoor pool that extra touch of luxury. We love the tiny flowers and plants that line the edge of the pool! This may be a minimal garden, but it's one with real impact. Also, note the use of soft red bricks on the walls. They give the entertaining area an earthy, natural and rustic feel. 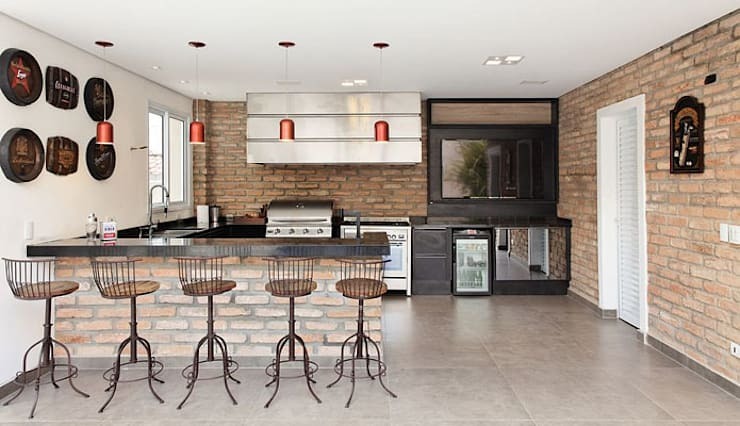 The outdoor-style kitchen has brick walls on three sides. 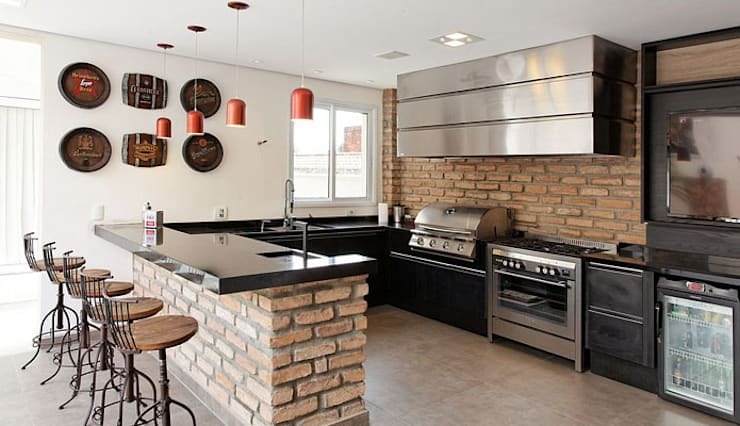 This helps integrate the kitchen with the outdoor area and gives the home a modern, rustic ambience. The stone floor, antique-style iron stools and black cabinetry accentuate the look. But one of the most important elements in this kitchen is the outward-facing layout. This helps maintain communication between the two areas. From this angle we get a better sense of the deep ruts and contours in the brick walls. Variation in tone and texture is a big part of a rustic look; it gives a home a very earthy and welcoming feel. Aside from this, note the lovely thick black bench and kitchen sink. It allows the chef to keep an eye on children in the pool or chat to visitors as they please. If you're interested in elegant natural dwellings, don't miss A home of Zen-inspired elegance. It's truly special! What do you think of the outdoor entertaining area in this modern family home? Let us know in the comments field below!